What does the Tecan do? The Tecan Freedom Evo 100 machine is an automated liquid handling system with a robotic arm that allows fast, robust, accurate and reliable pipetting for a variety of bioassays in 96- and 384-well format. The system is packaged with user-friendly software that is used to design user-specific protocols. This allows the transformation of any traditional assay to a highly reproducible automated assay. 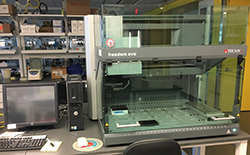 This robotic system has numerous scientific applications, including: compound screening, plate replication, plate reformatting, assay development, PCR and clinical sample processing. 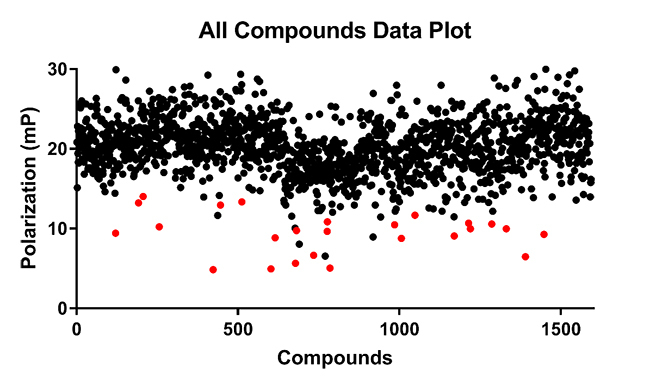 High-Throughput Screening – This is an example of an automated fluorescence polarization screen of over 1,500 compounds using the Tecan Robot. Note: This screen was performed in 384-well format and identified several hits (red).